In-laws can be in something of a precarious relationship with the couple who is trying to get pregnant. Undoubtedly there will be boundary issues, privacy issues, and life transition issues. Couples may find they can communicate fairly comfortably with their own parents, but this communication can become decidedly more awkward when it is with parents-in-law. What sensitivities will help in-laws from both generations to be more supportive of each other as a pregnancy is being anticipated? Research shows that boundary issues are present in most families, and that the boundaries shift over time, are heightened at times of crisis, and are made more awkward by lack of familiarity. So, the family who raised you observed its own “rules” for who was considered to be in what roles in the family. These boundaries shifted over time, but you were probably able to keep track of how your family handled emotional closeness, obligations, power, and changes in roles. Likewise, your partner has had the same familiarity with boundary issues in the family that raised him or her. So where’s the problem? Maybe not at all, if the two of you were raised in families that treated family members somewhat similarly with regard to roles and boundaries. But, since most families have their quirks and unique dimensions, getting familiar with your in-laws and their family expectations can feel fairly daunting. And, if you are trying to figure out these boundaries at the very time you anticipate enlarging your own new family, the in-law issues can become pretty sensitive! Life transition issues tend to be especially emotion laden. So news of your hopes for a pregnancy is not just about reproduction. It also is about anticipating grandparenthood, about family traditions, about geographical closeness/distance, about selecting names, religious rituals, finances and even health care expectations. And remember we are talking about two sets of older in-laws who may have quite distinct opinions in these areas. 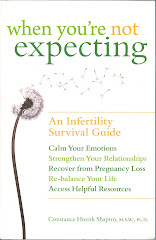 And I would like to add some words here for couples who are having difficulties conceiving. If you have shared your hopes for a pregnancy and ultimately begin a medical investigation about infertility, do not be surprised if your parents and your in-laws are inquisitive to the point of being intrusive. This is especially sensitive because you are dealing with your own worries about whether parenthood will even be possible, and the older generation may be both uninformed and awkward about trying to understand what is happening in your lives. What is happening can include diagnosis (how much will you tell? ), treatment (how much can you afford? ), new reproductive technologies (how will news of donated eggs or sperm disrupt the older generation’s hope for a grandchild that has their genes? ), and perhaps the options of adoption (again the issue of genes and family resemblances), or child-free living. Being able to confide in one’s parents can be a challenge for couples with infertility, and that challenge may be even greater with in-laws whose communication style may feel stilted or awkward. Moving back to the original blog question: what sensitivities will help in-laws from both generations to be more supportive of each other as a pregnancy is being anticipated? An important consideration is that you and your partner need to feel respected by your in-laws. Danger signs would be any evidence of jealousy of the child-in-law, intimations that the child-in-law is not welcome in the family, or constant and unwarranted criticism of the child-in-law. These are signals for you and your partner to be clear that you love and respect one another and you will not tolerate signals by the in-laws to try to create discord between you. Another danger sign could include in-law competitiveness for the time and attention of you and your partner, with the purpose being to exclude the other set of in-laws from involvement with both of you. Here it is important for you to make your own decisions about how to divide your time and energy among various family members and to be firm with parents and in-laws that you are trying to be fair in your decisions, and to be clear that the older generation needs to respect your right to do this. So what else can you do to soothe the ruffled feathers of in-laws? You already are making a good effort when you state clearly that you love each other and expect them to respect that. In addition, there is always the strategy of staying in touch, so the in-laws don’t feel they’ve lost their child to you. Whether through phone calls, or holiday/birthday/anniversary cards and notes, in-laws will appreciate your efforts to stay connected despite busy schedules and geographical distances. And this is important before any pregnancy occurs, because if you think the in-laws are competing for your time and attention now, just wait until the little bundle of joy arrives! So in-law sensitivity runs between both generations, and perhaps you and your partner will sense that many in-law difficulties stem from a yearning by the older generation to hold tight to their child. This may feel especially pronounced around times of family transitions. Anticipating a pregnancy is an exciting and an anxious time for couples, for parents, and for in-laws. On the one hand you will want to emphasize your own autonomy as a beginning family; on the other hand, you can anticipate that your separation from parents and in-laws is likely to trigger some possessive responses. Try to keep the lines of communication as open as possible, but be clear when you believe parents or in-laws need to back away and give you some space to establish yourselves as a young family. Infertility: Do You Wear A Scarlet Letter?